This is the third installment of a series of excerpts from my new book, STEAL THIS BOOK, NOT MY VOTE. Due out April 7, 2012, the one-year anniversary of Kathy Nickolaus finding 14,000 votes two days after Joanne Kloppenburg was declared the winner of the 2011 Wisconsin Supreme Court election. Without those votes, there never would have been a recount, and we never would have known how corrupted our election systems have become. 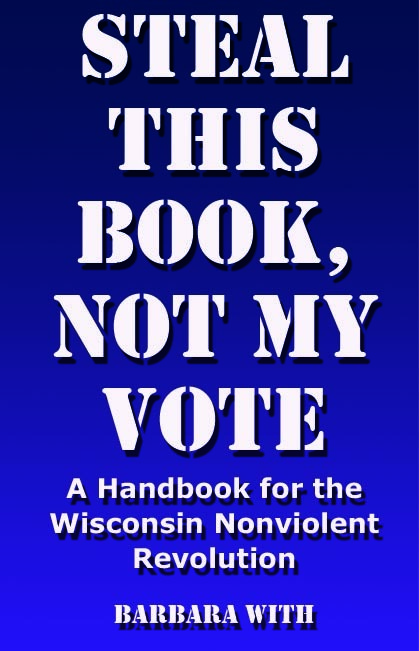 It is my hope that STEAL THIS BOOK, NOT MY VOTE can help inspire needed reforms to protect our elections in time for the recall of Scott Walker. May we then, as Wisconsin is known to do, go on to inspire a national movement. Justifying his union-busting ploy, Walker told us in February 2011 that, “the path to long-term financial solvency for our state requires shared sacrifices from everyone.” Later in April, Walker would come before a federal Senate Oversight & Government Reform Committee, and testify under oath that reducing the teachers union’s ability to negotiate contracts had absolutely no affect on the budget. But in February 2011, corporate media was blasting the message that unions were the cause of the fact that, “We’re broke.” Never mind the tax breaks Walker gave to his crony corporate friends the first month he was in office that were adding $117 million to the state’s budget problem over the next two years. According to Walker, the bottom line was, “We’re broke.” Busting the unions was the only way out. This was the first big lie. As the Democratic senators read the bill they were ordered to pass in less than a week, shock and awe set in. They knew when average Wisconsin citizens read the bill, they, too, would be horrified. The loss of collective bargaining rights was just the tip of the iceberg. Suddenly, teachers and public workers were being painted as the enemy. Years of building a state that benefited the good of all, erased. Decades-long coalitions between Democrats, Progressives and Republicans and public sector unions were crushed. Raided funds were being drained into black box accounts. Environmental protections – gone. Public education and healthcare were gutted. Tax breaks for the wealthy and the corporations at the expense of the under-privileged were prioritized above all else. Privatization of public services, state-owned power plants being sold for $1, unions dismantled, public education in ruins—this Republican administration designed this budget repair bill to destroy Wisconsin. They were about to cut us off at the knees. What few average citizens knew back in February was that the “budget repair bill” was the product of the American Legislative Exchange Council (ALEC). Nor was it known that this far-right, Koch Industries-funded organization also provided the same draconian budget template for the newly-elected governors of Ohio, Indiana, Florida, and Michigan—all states with significant waterfronts. 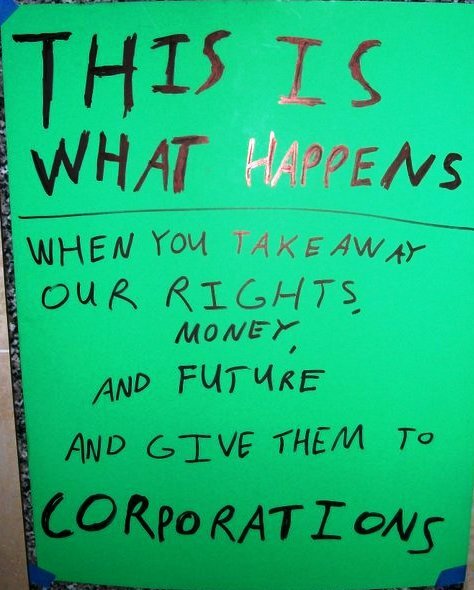 These ALEC budgets were intertwined. Partnered with other ALEC legislation about to come down the pike, the plan was intricately designed to legislate corporate free rein, allowing them to “legally” to do as they please without consequence. 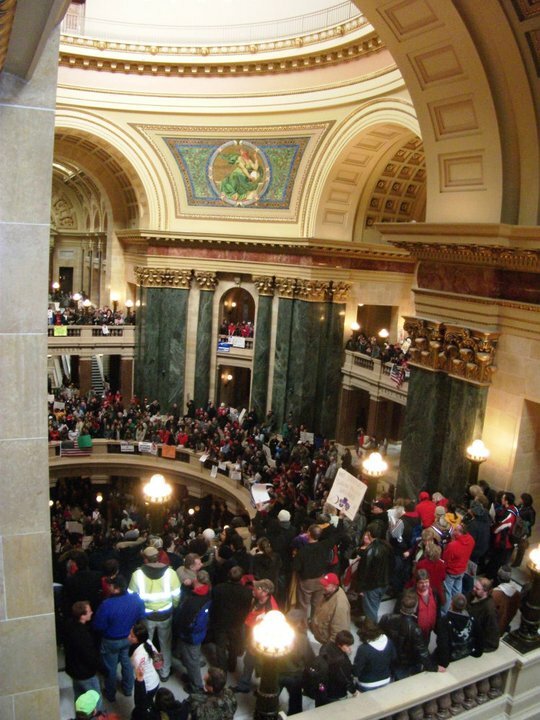 As it turned out, most every Wisconsin Republican legislator has been or is a member of ALEC, including Scott Walker and both majority leaders of each house. This gives the appearance that the 2011 Republicans were playing their part in the orchestrated hostile takeover of the state. By using their offices to abuse their power of majority, they were prepared to pass bills that would take away our constitutional rights, dismantle public education, dis-empower workers, wage a war against women, bankrupt communities, steal and destroy natural resources, and build in tax breaks and protections for corporations. Following this course, our counties, cities and towns would be starving for resources because of their abuse of power, they would claim emergency and declare a form of financial martial law, as they had done in Michigan. Finances would become so bad that we eventually wouldn’t be able to govern ourselves, they would tell us. In Benton Harbor, elected officials were stripped of their authority and an Emergency Financial Manager was costing taxpayers $150 an hour, even though Michigan was “broke” too. In one stroke of Gov. Snyder’s pen and the power of majority in their legislature moving as quickly as Wisconsin should have been, Michigan citizens basically lost their right to vote. Wisconsin was not to be far behind. The public hearing on the budget bill was scheduled for Tuesday, February 15 before the Joint Finance Committee. Co-Chair Robin Vos (R-Burlington and WI State Chairman for ALEC) announced they would hear public testimony and then vote it out of committee later that day. But thousands of people waited in long lines outside the hearing room for a chance to speak about the bill. An overflow room was set up, which quickly filled. Large-screen televisions were set up in the rotunda for the approximately 4,000 who were keeping a 24-hour vigil there. At the 17th hour of public testimony, Vos decided he’d had enough. “People are talking about issues we already heard before,” he declared and closed the hearing. Citizens in the hallways rebelled, chanting and demanding to be heard. Democrats opened up a hearing room after Vos shut out the public and continued testimony. As long as the Democrats had the hearing room open, the rest of the capitol had to remain open as well. People slept in the rotunda and in the hallways outside the hearing room. Later the following morning, the Democrats rested their case. At noon that day, Vos reconvened the Joint Finance Committee and easily passed the bill through with a majority party-line vote. It would have been on its way to the Senate where speaker Scott Fitzgerald (R-Juneau, member of ALEC) had a 19-14 majority. From there, it would sail on to the Assembly, where Speaker Jeff Fitzgerald (R-Horicon, member of ALEC) had a 59-39 edge. Then on to the new Governor, and Wisconsin would be in the bag. Since the budget was a fiscal concern, a three-fifths quorum would be needed for it to pass. In the Senate, that meant at least 20 members had to be present to pass the bill, regardless of party. While Jeff Fitzgerald (Fitz, the Younger) had quorum in the Assembly, Fitz, the Elder needed at least one Democrat present in the Senate to call the vote. Meanwhile, the crowds at the capitol grew. Many camped inside overnight with more massing outside. How in the world could the 14 Democrats stop this apparent takeover of the government of Wisconsin? With Stephen “Papa” Fitzgerald the newly-appointed head of the State Patrol and Attorney General J.B. Van Hollen a Walker supporter as well, the State of Wisconsin seemed prime pickings for the ALEC fascists. All they needed was to pass this budget, and all state resources would soon be in the hands of the corporate members of ALEC. As they secretly met outside the capitol building, the Democratic Senators knew they didn’t have a chance against what they were up against, and that most of the state had no clue what was in the budget repair bill. With corporate media propaganda filling the airwaves about how courageous Walker was for making “tough choices,” the Democrats knew the truth. This was not business as usual. This budget repair bill, brought forward pre-formed, without input from the people or the other parties, would bankrupt the state. No negotiations; the Dems were told on February 11 that they would pass a budget repair bill that neither they nor the public had any input on by February 17. Even after hours of public hearings, nothing in it changed. So now what? Rumor has it that the night the Democratic Senators fled the state, over cocktails, one rogue Republican leaked the news to his friend from the other side of the aisle: Senate Republicans were going to do a “call to the house” procedure. This procedure would basically lock them into the Senate and force the vote on the budget repair bill. Since the Republicans had the majority and only needed one Democrat present for quorum, it was “go time” for the Democratic Senators. Whatever they were to do, they all had to sign on to the plan. If even one of them stayed behind, it would be for naught. At some point, they all agreed to leave the state. Not knowing how long they’d be gone, they grabbed overnight bags and planned to meet up at the Clock Tower Inn in Rockford, Illinois, a famous midway point between Madison and Chicago. There they would regroup and figure out the next step. They hoped that by leaving the state as a way to filibuster this unfathomable budget repair bill, the rest of us would have a chance to learn what they knew. But what to do once they got to Rockford? And how would citizens respond to their leaving? These were two entirely unexplored questions in Wisconsin politics. From the start, Republican hubris has been their Achilles’ heel. Their lies and illegalities revealed them early on as traitors. Walker and his lackeys lied about their intentions from the start. They would eventually ignore restraining orders, pass bills in secret, steal resources, and make rules to limit freedoms of speech, the right to assemble and to petition the government. At every turn, they would lie outright, with the corporate media getting their backs. In all, they stopped working for us as public servants. Abandoning their oath to protect the constitution, they pledged their allegiance to corporations, demonstrated by openly locking us out of the process and passing ALEC-authored bills that stripped away our rights, and left our land, air and water vulnerable and open to the highest bidder. Even though the Democrats’ sojourn to Illinois was not illegal, the propaganda machines churned into full spin. Painting the Democrats as cowards, right-wing talk-radio stations frothed up the loyal masses, keeping them blind to the truth of the hostile takeover. Certainly, without knowing the rest of the story, the protesters look scary, especially with Fox News falsely advertising a violent protest from Sacramento as having taken place in Wisconsin. The rest of the country was being told that the people occupying the capitol round the clock for weeks on end were violent union thugs, paid out-of-state agitators, hippies, dirty slobs and every other name in the book to distract from the real issue: the awful consequences of the bill. In truth, the peaceful protests were filled with citizens from every walk of life and every corner of Wisconsin—teachers, geologists, small business owners, cops, consultants, fire fighters, private sector workers, farmers. No one put anyone up to it; few if any were from out-of-state, and no one was being paid. Most were acting from an innate sense of civic duty and a long history of political engagement. It was truly a spontaneous public uprising. How in the world were we going to combat this propaganda echo chamber of lies the media was pumping out? In February 2011, knowing the Democrats were out there somewhere, with the capitol occupied 24/7, the whole world was watching as we all waited for the other shoe to drop.